This is one of very very few villas in Phuket where you can walk 30 metres to the beach through tropical gardens and with a beautiful large pool. On the South of the Island, facing West with spectacular sunsets. Ideal for those who wish to be with family and friends right on the beach. Large master bedroom can accommodate beds for small children, and with en suite shower/bath. Maid service. Babysitters can be arranged. A walk along the beach takes you to a Panwa Beach Resort or carefree beach restaurants for delicious seafood and drinks with your toes in the sand or in the sea! The living room/dining/kitchen are all upstairs to take advantage of the great views of the sea. A large terrace outside for dining/BBQ. The master bedroom opens onto a terrace also facing the sea. Our Guests are always pleasantly surprised and love the setting. Phuket can be for either peaceful or active vacations, e.g. scuba diving, sailing, golf, or just for relaxing on the beach and taking your time to visit spas, temples, restaurants, night life. The pool is good for kids, long and great for swimming, and right next to the beach. Thai/European restaurants nearby, and can be walked to along the beach or road, or dining can be ordered in. Boat/diving trips to islands from beach or harbor close by. Golf at one of four courses. Maid cleans the house three times a week, changes linen. Full maid service or babysitting can be arranged with advance notice. If you have Google Earth look up our villa on these coordinates 7deg 49' 05.40' N and 98 deg 23' 05.43' E and you can see the villa from satellite photos and with surrounding areas to zoom in/out. Availability: can change at short notice, so contact for dates and we will get back to you quickly. Moorings! We had a fantastic holiday and your villa was just superb. We are family who love the sand and the sea and like to travel around Thailand and other countries. This is our dream home for us family to be by the beach. The children growing up staying here every summer holiday. Now they are older and have jobs so we use it occationally to get together. It is close to the beach and has got beautiful sunset. It is peaceful and feel very relaxed. Full equipped kitchen, Large BBQ on the terrace. The main bedroom is large enough to accommodate extra beds for those who wish to have their children sleep close by. Cots available on request. There's sofa bed, sleep two for children or one adult. We have stayed here on a number of occasions and it is superb. Whilst it is in the south, in a quieter area of Phuket, it is stunning and the beach is beautiful. Restaurants are a few minutes drive and 20 minutes by boat to Coral Island. I would highly recommend this villa to anyone who looks for a relaxing beach holiday. Spent a holiday in this lovely villa and highly recommend it! Very spacious with high ceilings, lots of windows and very large patio with ocean views, big table and BBQ. The villa itself is Thai style with exposed beams and wooden floors throughout. THe beds are big and comfortable and the bathrooms are also very big, each with its own bath and shower. I had the most relaxing time here. It's very quiet and is situated just a few steps away from a small beach that only a few other small hotels have access to. There are some really nice restaurants on the beach, just 4 minute walk from the villa, or it's a short drive to other beaches and restaurants. But I could very easily just have stayed at the villa for an entire holiday - it's just so beautiful and relaxing. There's a large pool that overlooks the tranquil bay and some lovely day spas very close by. Very easy to get to from Phuket airport. If you're after a relaxing beach holiday this is the perfect place! My wife and I are in our mid forties and work and live in China. We decided at the last minute to have a vacation to Thailand and found the Villa on the internet. I have to say right from our initial contact with the owners to airport pick and through the whole holiday it could not have been a better experience. We had our wedding anniversary whilst there and I asked if they could help organize some thing special for me Wow did they, Flowers and wine delivered to the Villa a car and driver to take us to one of the best restaurants in Phuket. They also organized a car hire for us at the last minute with the car brought to the villa. Nothing was too much trouble, this was the sort of attention to detail and service very rarely found these days. Now to the Villa itself, what can I say it was fantastic every thing you could possibly want to get away from it all. Great facilities inside, a great balcony perfect for watching the sunset with a drink. Lovely pool, beach 30 meters away (the photos do not do it justice). The Beach itself is not ideal for swimming in but if you want beaches there are plenty to choose within a 35 minute drive. If you are looking for wild action this place is not for you (go to Patong) but if you are looking for some where to totally relax with great accommodation and stunning scenery then this place is absolutely for you. Phuket town is only 10-15 minutes drive away with good shopping for both day to day needs and gifts and souvenirs. Try the weekend Market and make sure you eat there, great food and really cheap. Another great place to eat is cloud 19 just a short walk down the beach from the Villa. This is a good quality restaurant with great food and service and really well presented. I would advise renting a car as this is the best way to get around and see more of the island. To sum up our break, one of the best we have had in a while. Would I come back? well let’s put it like this I nearly did not write this review because I did not want to many people to find out about this place. I would come back in a heart beat. Jaieur between yourself and your wonderful management staff you gave my wife and myself a fantastic holiday. We spent a blissful week at this gorgeous villa and it was utterly perfect for what we needed and we can't stop raving about it to all that will listen. Traveling with a baby, having this much space to come home to at the end of each day was fantastic. The property and the grounds where wonderfully maintained, and the managers where so friendly and helpful with all of our needs. We had arranged to meet them at the airport, and they made finding the villa so easy and hassle-free. The kitchen had everything you would need to cook up a feast, although we ended up eating out at the local restaurants up the road most nights. The rooms were wonderful and big, far bigger than the three of us really needed - it was a real treat. I loved the big decks, perfect to watch the tide come in and the air-conditioning was heaven after a hot day outside - especially for our bub. We decided the thai massage a few doors down was the best we tried in thailand. It is so peaceful on this side of the island, it made for a great contrast to the crazy, touristic parts of the island. We loved spending lazy mornings at the pool, which we had to ourselves everyday. We arranged a hire car, so could get to all parts of the island in our own time. Everything was within a 30 minute drive, so lovely and easy. We would definitely recommend this villa to all our friends, and we definitely plan on visiting it again soon. 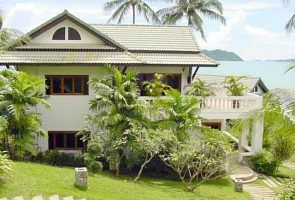 This villa is perfect for a family and great if you have a fair amount of time to spend in phuket. Nous venons de passer 1 semaine de reve dans cette villa vraiment agreable ou l'on se sent comme chez soi. La vue est superbe et les couchers de soleil incroyables. Nous avons deux enfants et ils avaient tout l'espace possible pour jouer dans le jardin (tres bien entretenu), a la piscine (un peu profonde) et sur le sable de la mer (directement accessible). L'endroit est tres calme, on entend des oiseaux. le bruit de la mer et la brise dans les palmiers, le reve ! Il est preferable d'avoir une voiture pour se deplacer et decouvrir plus facilement l'ile de Phuket et ses nombreuses plages car la villa est quand meme un peu a l'eccart - mais pas isolee. Nous sommes alles plusieurs fois dans le centre ville (Phuket city) ou il y a plein de bons restaurants (15 mn de la villa). Il y a des petits supermarches tres faciles d'acces pour faire ses courses et trouver du poisson frais a faire griller sur le barbecue ! Aussi, tres bons echanges avec le proprietaire lors de la reservation et l'accueil de Khun Pond sur place etait parfait, elle est tres agreable et a tout fait pour se rendre utile et nous satisfaire pendant notre sejour. Le menage etait fait tous les jours et c'etait drolement appreciable. Bref, nous sommes ravis, nous avons vraiment adore cette maison et esperons pouvoir y retourner un jour. Merci beaucoup. Nous espérons que vous apprécierez notre villa de nouveau! Thoroughly recommended. Beautifully clean. Lovely welcome with flowers and some useful starters (tea, coffee etc.) Huge living/dining space (hard to capture in a photo) and master bedroom, two other good-sized bedrooms. Attractive hard-wood floors for comfortable barefoot living. Huge balcony gives fine views (you will go home with sunset shots...) Excellent pool though deep for tots unless accompanied, I guess. Proper springboard. Lovely lush gardens around the villas. So peaceful, it's hard to believe it's ten minutes' drive from Phuket town (night markets etc.) and one minute along the beach from quite a posh Novotel (useful facilities, including high-quality Thai massage.) The beach is good for swimming and paddling at high/mid tide only. Along the beach there is a friendly good cheap restaurant/bar, and another just on the brow of the hill on the road. We didn't cook much! The maid service is excellent (such nice people) and Lynx Management very efficient and helpful. It is easy to get day trips out to islands for snorkelling and diving. We hired a vehicle, but I reckon you could get by without hiring a car if you wanted a peaceful holiday without too much exploring. Driving is...pretty interesting! But OK with special care and anticipation. (Those mopeds...) Taxis are easy and cheap (a rank just up on the road by the hotel.) It really was, for us, an easy, beautiful place to stay. And we had two babies under ten months with us (great for them - right by beach and pool, but easy to get them cool and out of the sun.) There is even a lovely carving of the Buddha on the stairs to make sure your frame of mind is suitably tranquil throughout. Khao Kard is in the south part of the island, and faces West for beautiful sunsets. Nearby is a famous view spot. To get to Kata/Karoen takes about 15 minutes drive. The town of Phuket is just 10 minutes away. There is a resort hotel 200 metres away, and a small convenience store within 10 minutes. Most people shop at Lotus supermarket or Big C just outside Phuket town. There is a new mall with cinemas about 10 minutes drive. There is very little traffic past our villa so it is very peaceful. Golf is at Phuket CC or Loch Palm Course (see new Red Mountain course - spectacular! ), about 15 minutes drive. Other Activities: shooting range, elephant treks, bungee jumping, para sailing, snorkelling, boat rips to islands. Rates include taxes. One way airport transfer included for stays over 6 nights. 25% deposit on booking. Balance 45 days before arrival. Euros 200 security and telephone deposit by cash or Paypal upon arrival Rate for per property for 6 guests. A party more than 6, rate will be charged each extra per person of euro 10 per person per night. Stay 7 nights only pay for 6 except Peak period.